In Play of the Week 5 of the 2017 series, we are examining offside, in particular ‘Interfering with an Opponent’, and discussing best practice when faced with such decisions. The two plays we are looking at are from Houston Dynamo versus New York Red Bulls and Portland Timbers versus New England Revolution. In both situations, goals are scored and a teammate of the scorer is in an offside position, potentially obstructing the goalkeeper’s line of vision in each. Interfering with an opponent, in most cases, is interfering with the goalkeeper by being in their line of vision. As I have said on numerous occasions, the only person in the stadium who really knows whether the forward is clearly obstructing the goalkeeper’s line of vision is the keeper himself! The best camera angle on these plays is always the one behind the goal – you can see the position of the goalkeeper, the offside player, and the individual playing the ball. These are calls that are extremely difficult for assistant referees to judge as, from their angle on the touchline, they have no depth perception. Consequently, they have to rely on the referee to assist them. The referee, from an on-field central position, has a far superior view. Modern day referees will be fully aware of that and advise the AR accordingly. It is actually called the jigsaw effect, where the AR has the knowledge that the player is in an offside position and the referee, from a better viewing angle, can decide the interference. When we look at the first play, in the Houston Dynamo versus New York Red Bulls game, we see Dynamo’s Erick Torres shoot towards goal. As the ball gets closer to Red Bulls’ goalkeeper, Luis Robles, Torres’ teammate Andrew Wenger moves towards Robles. Knowing he was in an offside position, Wenger ducks to avoid contact with the ball. Let’s examine the interfering with an opponent criterion in the Laws of the Game. The only categories that can potentially be under consideration in this play are the first and the final ones. Luis Robles can clearly see both Torres and the ball. He dives and gets a hand to the ball. So, in this situation, clearly obstructing the opponent’s line of vision does not apply. Does Wenger make an obvious action, which clearly impacts on the ability of Robles to play the ball? This is subjective. It all depends whether you believe that the movement of Wenger has any impact on the goalkeeper’s ability to save the ball. With the ‘line of vision’, the only person who really knows that fact is Robles himself. In this case, as Robles’ movements didn’t appear to change or hesitate, then the correct decision was made to allow the goal. So how did the crew arrive at this decision? As I was explaining earlier about the virtues of dialogue, in this particular case there was no dialogue between the AR and referee. AR Jose Da Silva felt that, from his angle, he knew that Wenger was in an offside position. He didn’t consider that Wenger was interfering with the goalkeeper. Referee Fotis Bazakos fortunately knew himself that Wenger was in an offside position and decided that Wenger did not interfere with Robles. On this occasion, the correct decision was made. That Da Silva did not engage in dialogue was dangerous and risky. If Bazakos hadn’t known that Wenger was in fact in an offside position, he could have allowed Wenger to clearly obstruct. 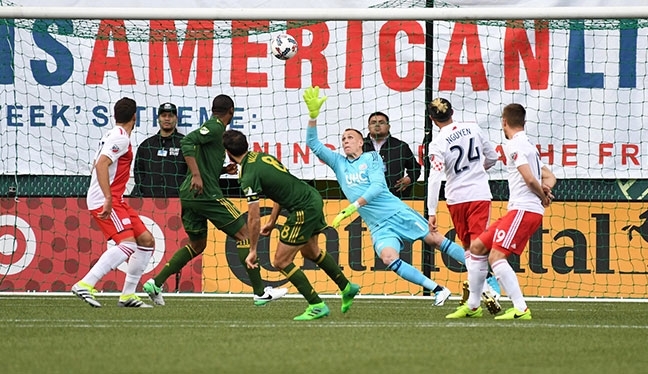 The other play to examine, from the Portland Timbers versus New England Revolution game, sees a world class strike from Timbers’ Diego Valeri open the scoring. His teammate, Fanendo Adi, is standing in an offside position, potentially obstructing the line of vision of Revs goalkeeper Cody Cropper. This really was a more straightforward call for AR Mike Rottersman than the previous play we discussed. However, he is diligent and takes no risks, knowing that Adi is in an offside position and is in the vicinity of the goalkeeper. Rottersman asks referee Kevin Stott if Adi is clearly obstructing Cropper’s line of vision, he stands his ground and doesn’t move until Stott confirms the goal is okay. This is the excellent standard practice and one that is fully endorsed by PRO. In summary, both plays featured correct decisions but they were processed in two totally different ways. The vitally important key to arriving at the correct decision is dialogue and putting the two pieces of the jigsaw together. Never assume and take risks!